Los Bambinos | Best local musicians…experience an unforgettable show! Best local musicians…experience an unforgettable show! Celebrate with Los Bambinos Tonight! Enjoy a 4-Course Dinner and Show from 7 -10 pm. This special event will be perfect for those that may prefer to catch a show on the early side of the evening. Dinner & Show begins at 7:00 and will last through 10:00, featuring two options for dinner: an exquisite four-course meal or regular restaurant menu accompanied by a delightful show. Join Los Bambinos and Bambinos Trattoria’s talented kitchen team for a memorable meal and celebration! Don’t miss a great time with Los Bambinos as you ring in the New Year! Reserve now and celebrate with us the first party of the night! Tonight from 7 pm-10 pm! We will play Carlos Santana, The Beatles, Latin rhythms, Bee Gees, Beach Boys, and a lot of fun great tunes! As always, the brothers add their unique spin on the International rock selections in a special thematic show, setting the well-loved songs into the Mexican musical landscape… for an exciting and upbeat show. Bambinos Trattoria is located at Aguacate #314, at the corner of Carranza street in Old Town Puerto Vallarta, just before Mundo de Azulejos. For Los Bambinos reservations: Online www.losbambinosmusic.com or 222-4357 (English Spoken). See you at Bambinos Trattoria! Celebrate with Los Bambinos this New Year’s Eve 2019! This NYE, join Los Bambinos and Bambinos Trattoria’s talented kitchen team for a memorable meal and celebration! This special event will be perfect for those that may prefer to catch a show on the early side of the evening. Dinner & Show begins at 7:00 and will last through 10:00, featuring two options for dinner: an exquisite four-course meal or regular restaurant menu accompanied by a delightful show. Don’t miss a great time with Los Bambinos as you ring in the New Year! This season Los Bambinos present three nights of Rock n’ Roll in a highly anticipated two-hour shows, and their classic Latin show. The group brings their cabaret-style entertainment to the stage at Bambinos Trattoria for over a decade running in Old Town Vallarta. This season, the Morales brothers do not disappoint. “Rock n’ Roll” is a great sound for Los Bambinos, who bring the favored sounds of the Rolling Stones, the Doors, Elvis, and the Bee Gees to the stage right here in Puerto Vallarta! 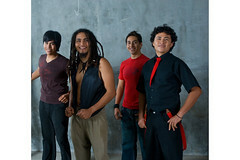 They add their unique spin on the music, setting the well-loved songs into the Mexican musical landscape… true to the group’s upbringing in classical Latin guitar. They set the show off with tight harmonies and sweet banter, which only brothers can pull off. So, get on your dancing shoes and bring friends for a good time with Los Bambinos at Bambinos Trattoria. Reserve your table early for the best seat in the house. Monday Night 8pm New Year’s Eve with Los Bambinos! As always, the brothers add their unique spin on the International rock selections in a special thematic show, setting the well-loved songs into the Mexican musical landscape… for an exciting and upbeat show. This dynamic show beautifully presents the authentic range of the group’s voices. Los Bambinos music does justice to this iconic musical era and artist. Los Bambinos bring to life these different styles of Rock n’ Roll that have been so influential over the last few decades. They present for you The Kings of Rock n’ Roll- as only Los Bambinos can- through a loose chronology of Rock legends from the Rolling Stones, the Doors, the Eagles, the Monkees, Elvis, to Little Richard and Chuck Berry among many others! This is the show for an exquisite mix of rhythms and beautiful vocals. It is a show just as spicy as it is sweet. Each song sweeps you away to a Brazilian Carnival or a romantic evening in an Old Mexican town square. Don’t be surprised if you hear your favorite Mexican tune set in a foot-tapping Cuban rhythm! Let Los Bambinos awaken your senses with vibrant music, and inspiring four-part harmonies. Since 2004 Los Bambinos voices fill the Puerto Vallarta Romantic Zone nightly. Their Dinner-Show performances at Bambinos Trattoria are the perfect way to enjoy the tradition of music in Puerto Vallarta. Delicious and authentic Italian (www.bambinostrattoria.com) is served Monday through Saturday 3-11pm. Please reserve early, as seating is limited. Find Bambinos Trattoria on Facebook @losbambinostrattoria and unbiased reviews on Trip Advisor. Bambinos Trattoria is located at Aguacate #314, at the corner of Carranza street in Old Town Puerto Vallarta, just before Mundo de Azulejos. 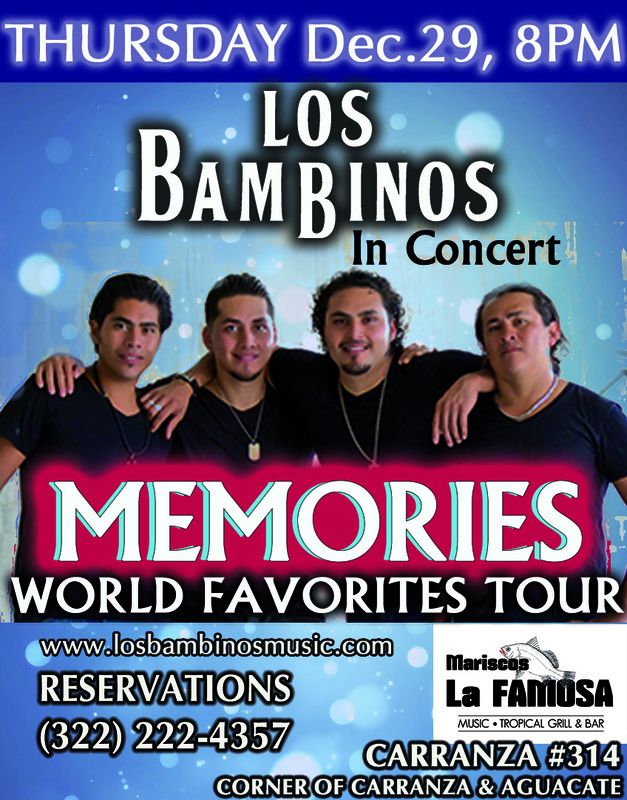 For Los Bambinos reservations: Online http://www.losbambinosmusic.com or 222-4357 (English Spoken). See you at Bambinos Trattoria! Do not miss the chance to see the Brothers Band performances at Bambinos Trattoria while you are in town! Join us for a wonderful evening of music and delicious Italian food prepared with experience and love, lots of love. Let us conquer you with flavor and at the same time please you with our music. As Four Brothers we have something to offer all musical tastes. Whether you prefer to sing along with The Beatles, Dance with the Fiesta Latina, or want to experience a fun and romantic evening with Elvis Presley selections, you will be happy with your choice to join us for a special Dinner & Show. Do not miss the chance to see The Bambinos Band performances while you are in town. See you at the show! Los Bambinos Present The Beatles, Elvis Presley, and Fiesta Latina! season has begun! With six weeks rehearsing, Vallarta’s favorites musical brothers are excited to bring their new shows to the Bambinos Trattoria stage! Now, you can enjoy a delightful meal from Bambinos’ Trattoria’s full Italian menu along with the show! Come see the group perform on their new stage in the heart of Puerto Vallarta’s happening Romantic Zone. This is one week of musical performances that you can’t miss! musical landscape… for an exciting and upbeat show. ELV1S takes the stage on Wednesday night, 8pm for a touching, fun and romantic evening. This show offers an astounding interpretation of Elvis Presley in the Morales Brother’s four voices and special guest Jorge Acosta! On Fridays, 8pm enjoy Fiesta Latina! This is the show for an exquisite mix of rhythms and beautiful vocals. It is a show just as spicy as it is sweet. Each song sweeps you away to a Brazilian Carnival or a romantic evening in an Old Mexican town square. Let Los Bambinos awaken your senses with vibrant music, and inspiring four-part harmonies. Bambinos Trattoria is a great place to enjoy fresh Italian Food, prepared by a team of talented Chefs. Open Monday- Saturday with a complete menu (from October 8th) Bambinos Trattoria is located at Aguacate #314, on the corner of Carranza street in Old Town Puerto Vallarta (just before Mundo de Azulejos on Carranza). Bring friends and reserve your table early for the best seat in the house. VIP section available in front of the stage. Seating for each show begins at 6:30. Visa and Mastercard accepted. Information and tickets at http://www.losbambinosmusic.com or call for a reservation (322) 222-4357, English spoken. Don’t miss this must-see show! We are a team committed to enchant you with our great, Homestyle Italian food. We will do everything possible to make you fall in love with our service, as we conquer you with our music in our casual and warm environment. Come one come all for a great evening of tasty Italian food and wonderful live show entitled Rhythm & Rock Night, performed by your favorite quartet “Los Bambinos.” Remember, the show is free with your purchase of your dinner! Seating begins at 6:30 pm. Reserve your table now, seating is limited! 322-222-4357 or Cell in Mexico 044-322-203-9914 (Please leave a message with your name, number in your party and if you will be joining us for Dinner! Stay tuned for online tickets. Join Los Bambinos as they open their own spot, this Thursday, December 29th, for their show entitled Memories. The best live music Puerto Vallarta has to offer the Morales brothers bring you a brand new show full of the harmonies fans love, the charisma and good- character that we can’t wait to see again for 2016-2017 Show Season! Enjoy a good bite to eat at this “seafood” theme grill, with top-notch drinks and relaxed atmosphere. For live music Puerto Vallarta brings LOS BAMBINOS to the stage! Don’t miss it! Their shows will continue every Tuesday night through January, so bring your friends for a great time!